Perhaps Websearch.searchdwebs.info looks like a reliable search engine with its user-friendly interface and clean design, but the program is nothing but a dangerous browser hijacker infection. This program manifests on Chrome, Firefox, and Internet Explorer by modifying your default homepage and search engine. This is a definitely annoying infection that tampers with your personal settings whether you like it or not. The hijacker could be associated with a number of potential security issues, and that is why it should be removed from your system ASAP. Just because Websearch.searchdwebs.info looks like a search engine, it does not mean it is one. The problem is that the hijacker is very intrusive, and it can even collect information about you that could be later on used in third-party marketing schemes. Websearch.searchdwebs.info employs tracking cookies to monitor your online activity. Luckily, it does not intend to steal your personally identifiable information, but there is no saying where the collected data could be used. For instance, the hijacker will find out what websites you visit and what you usually search for online. Once your online profile is ready, you can be sure to go through a flow of commercial advertisements via Websearch.searchdwebs.info, most of which, which will be related to your likes and preferences. 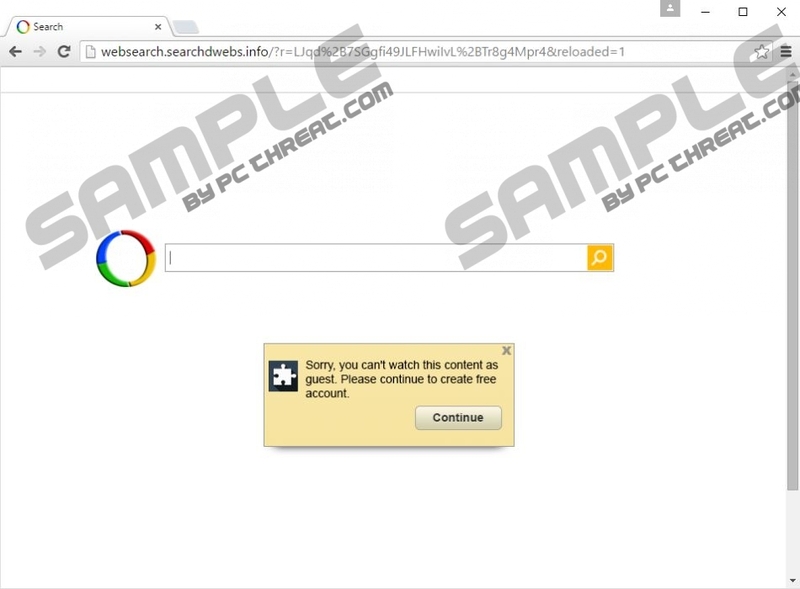 This kind of behavior is very common among the Websearch family of browser hijackers. The path has already been taken by the likes of Websearch.seekplaza.info, Websearch.freesearches.info, Websearch.searchero.info, etc. The browser hijackers will be used for third-party content distribution by unfamiliar people, and you can never know what their intentions might be. For example, if cyber criminals decide to make use of this hijacker to distribute their content and various malicious programs, it is only a question of time until you will get infected with severe computer security threats. Therefore, before any of that happens, you will do yourself a favor if you remove Websearch.searchdwebs.info right now. While you are at it, you should also remove all the other potential threats that might be hiding in the depths of your system. We are sure that this browser hijacker is not the only threat because it is not possible to download the program individually. Hence, the main distribution method employed by the browser hijacker is bundled downloads. It means that users download Websearch.searchdwebs.info and other similar infections in software packages with freeware applications that are widely available for download from file-sharing websites. If you have recently installed Unideals, Optimizer Pro, EZDownlaoder, LightningDownloader, and other potentially unwanted programs, it is very likely that Websearch.searchdwebs.info have arrived along with them. To put it simply, you have a number of security issues residing in your system, and you need to take care of them as soon as possible. Websearch.searchdwebs.info is just a top of the pile. Remove all the potential threats with a legitimate antispyware tool, and then reset your browser settings to default to delete Websearch.searchdwebs.info from your browser. If you encounter any difficulties while trying to protect your PC from harm, you can always leave us a comment and our support team will reply as soon as possible. Please consider acquiring a legitimate antispyware application that would also help you protect your PC against similar infections in the future. Quick & tested solution for Websearch.searchdwebs.info removal.